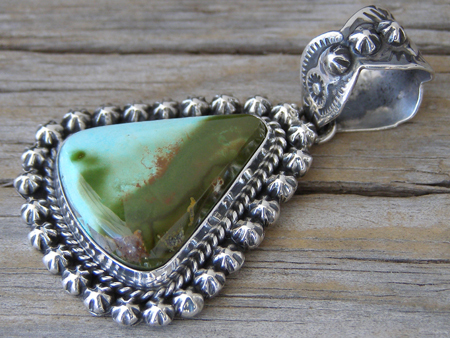 This pendant is set with a gorgeous two-tone pale blue and deep green stone of natural, untreated Royston turquoise from Nevada. The bezel is wrapped with twist wire and the border is formed by starred buttons. The bale has a scalloped edge and starred buttons set in a vertical row. Dimensions of pendant (excluding bale & jump ring): 1 1/4" x 1 1/8"